Are Tacca leontopetaloides (Linn.) O. Kuntze Mini-tuber Growth Affected by Media Composition and Tuber Size? Tacca (Tacca leontopetaloides (Linn.) O. Kuntze) is a tropical plant that is widely used for its starch in some countries as well as a medicinal plant. Tacca has advantages as it can grow on sand in tropical seashore areas and rain forests. Farmers in Madura Island Indonesia cultivated tacca by using mother tubers as propagules and harvest the daughter tubers, but no studies have been conducted on the growth of mini tubers and their cultivation. The purpose of this study was to find the best combination of planting media and the size of mini tuber for growing tacca. The experiment was set in a completely randomized block design with two factors and three replications. The planting media are sand : rice-hull charcoal : cow manure (1:1:1 v/v), soil : sand : cow manure (1:1:1 v/v), soil : rice-hull charcoal : cow manure (1:1:1 v/v), and soil : cow manure (1:1 v/v);mini-tuber weight are1-5 and 5.1-20 g. The result showed that Polynesian arrowroot grow best on sand : rice-hull charcoal : cow manure (1:1:1 v/v) and rice-hull charcoal : cow manure (1:1 v/v) media. Both propagules sizes can be used, but plants from large mini-tuber had better growth and produced larger mother and daughter tubers. Abdullah, T.L., Misrol, M.Z., Stanslas, J., Abd Aziz, M., and Goh, L.P. (2014). Effect of shade and morphological characterization of Janggut Adam (Tacca sp.) as a promising native ornamental and medicinal plant. Transanction of the Malaysian Society of Plant Physiology 22, 13-15. Ashagrie, T., Belew, D., Alamerew, S., and Getachew, Y. (2014).Effects of planting time and mother bulb size on onion (Allium cepa L.) seed yield and quality at Kobo Woreda, Nothern Ethiopia. International Journal of Agricultural Research 9, 231-241. Bevacqua, R.F. (1994). Origin of horticulture in Southeast Asia and the dispersal of domesticated plants to the Pacific Islands by Polynesian voyagers: the Hawaiian Islands case study. HortScience 29, 1226-1229. Booth, R., Harwood, R.K., and Mangion, C.P. (2004). “Field Key for the Monsoon Rainforest Flora of the Darwin Region”. 95 pp. Northern Territory University Press. Borokini, T.I., and Ayodele, A.E. (2012). Phytochemical screening of Tacca leontopetaloides (L.)Kuntze collected from four geographical locations in Nigeria. International Journal of Modern Botany 2, 97-102. Bruschi, P., Mancini, M., Mattioli, E., Morganti, M., and Signorini, M.A. (2014). Traditional uses of plants in a rural community of Mozambique and possible links with Miombo degradation and harvesting sustainability. Journal of Ethnobiology and Ethnomedicine 10, 1-22. Habila, J.D., Bello, I.A., Dzikwe, A.A., Ladan, Z., and Sabiu, M. (2011). Comparative evaluation of phytochemicals, antioxidant and antimicrobial activity of four medicinal plants native to Nothern Nigeria. Australian Journal of Basic and Applied Sciences 5, 537-543. Heyne, K. (1987). “Tumbuhan Berguna Indonesia I”. 2521 p.Yayasan Sarana Warna Jaya, Jakarta, Indonesia. Huang, Y., Liu, J.K., Muhlbauer, A., and Henkel, T. (2002). Three novel Taccalonolides from the tropical plant Tacca subflaellata. Helvetica Chimica Acta 85, 2553-2558. Hussain, S. W., Ishtiaq, M., and Hussain, S.A. (2001). Effect of different bulb sizes and planting dates on green leaf production of onion (Allium cepa L.).Online Journal of Biological Sciences 1, 345-347. Jiang, J. H., Yang, H. M., Wang, Y. L., and Chen, Y. K. (2014). Phytochemical and pharmacological studies of the genus Tacca: a review. Tropical Journal of Pharmaceutical Research 13, 635-648. Meena, K. L. and Yadav, B. L. (2010).Tacca leontopetaloides (Linn.) O. Kuntze. Indian Journal of Natural Products and Resources 1, 512-514. Marcel, N.R., Makhlouf, H., Nicolas, N.Y., Leopold, T.N., Balaam, F., Joel, S., and Carl, M.F. (2012). Comparative physicochemical, thermal and microstructural properties of starches from two underutilized taro ecotypes. International Journal of Bioscience 2, 64-74. Misra, S. and Misra, M.K. (2014). Ethno-botanical study of plants with edible underground parts of south Odisha, India. International Journal of Agricultural and Food Science 4, 51-58. Mualim, L., Aziz, S.A., and Melati, M. (2009). Kajian pemupukan NPK dan jarak tanam pada produksi antosianin daun kolesom (NPK fertilizer and plant spacing on leaf anthocyanin production of waterleaf). 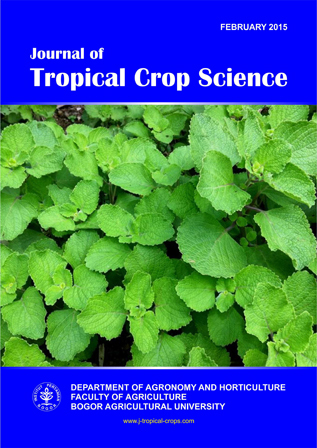 Indonesian Agronomy Journal 37, 55-61. Nandwani, D., Calvo, J.A., Tenorio, J., Calvo, F., and Manglona, L. (2008). Medicinal plants and traditional knowledge in Northern Mariana Islands. Journal of Applied Biosciences 8, 323-330. Ndouyang, C.J., Nguimbou, R.M., Njintang, Y.N., Scher, J., Facho, B., and Mbofung, C.M.F. (2014).In vivo assessment of the nutritional and sub chronic toxicity of Tacca leontopetaloides (L.) tubers. Scholarly Journal of Agricultural Science 4, 5-13. Pate, H.S., Badi, S.H., Dikwahal, H.D., Jibung, G.G., and Molchen, M.D. (2014). Response of Polynesian arrowroot Tacca leontopetaloides to fertilizer and intra-row spacing at Garkawa. Journal of Biology, Agriculture and Healthcare 4, 97-101. Saleh, I. (2010). “Pengaruh metode pemupukan dan kombinasi komposisi media tanam dengan pengapuran terhadap pertumbuhan cabe jawa (Piper retrofractum Vahl)” (Fertilizing method and media composition and liming on Piper retrofractum Vahl growth). Skripsi. Program Studi Agronomi dan Hortikultura, Fakultas Pertanian, Institut Pertanian Bogor. Soemono, S., Baharsjah, J.S., Wiroatmodjo, J., and Tjitrosoedirdjo, S. (1986). Pengaruh bobot bibit terhadap pertumbuhan, hasil dan kualitas umbi suweg (Amorphophallus campanulatus Bl.) pada berbagai umur (The effect of tuber weight on growth, yield and quality of Amorphopallus campanulatus Bl. tuber at different ages). Buletin Agronomi 17,17-22. Spennemann, D.H.R. (1994). Traditional arrowroot production and utilization in the Marshall Islands. Journal of Ethnobiology 14, 211-234. Ubwa, S.T., Anhwange, B.A., and Chia, J.T. (2011). Chemical analysis of Tacca leontopetaloides peels. American Journal of Food Technology 6, 932-938. DOI: 10.3923/ajft.2011. Ukpabi, U. J., Ukenye, E., and Olojede, A. O. (2009). Raw-material potentials of Nigerian wild Polynesian arrowroot (Tacca leontopetaloides) tubers and starch. Journal of Food Technology 7, 135-138. Wilkin, P., Schols, P., Chase, M.W., Chayamarit, K., Furness, C.A., Huysmans, S., Rakotonasolo, F., Smets, E., and Thapyai, C. (2005). A plastid gene phylogeny of the yam genus, Dioscorea: roots, fruits and Madagascar. Systematic Botany 30, 736-749.